The story, convoluted as it is, has all of these ingredients. Douglas Carter Beane wrote the Book. Music and Lyrics are by Jeff Lynne and John Farrar based on the Pictures Film Screenplay by Richard Danus and Marc Rubel. Playwright Douglas Carter Beane is quoted as saying he was influenced by 60’ television. His final influence came after he saw the film “Clash of the Titans” that he asked all of his actors to watch. Between that film and his fascination with Greek Mythology, he knew, on the first drafts of “Xanau”, that he wanted a trip to Mt. Olympus. He called set designer David Gallo who designed the flying Pegasus to take Clio back up to Mt. Olympus. It is truly a trip. His flair for camp is written all over the show. The 2007 Broadway musical arrived at the La Jolla Playhouse in 2008 thanks to Playhouse Artistic Director, Christopher Ashley. Ashley, who as a teenager saw the film in the ‘80’s and while he thought the story bad, he loved the music, he later admitted. Fast-forward and the same Christopher Ashley, who brought this Tony nominated hit to our fair city in its West Coast Premiere, was just in the throws of directing the Broadway musical, when he was tapped for the La Jolla slot after Des McAnuff announced he had taken a position in Canada at Stratford Shakespeare Company. 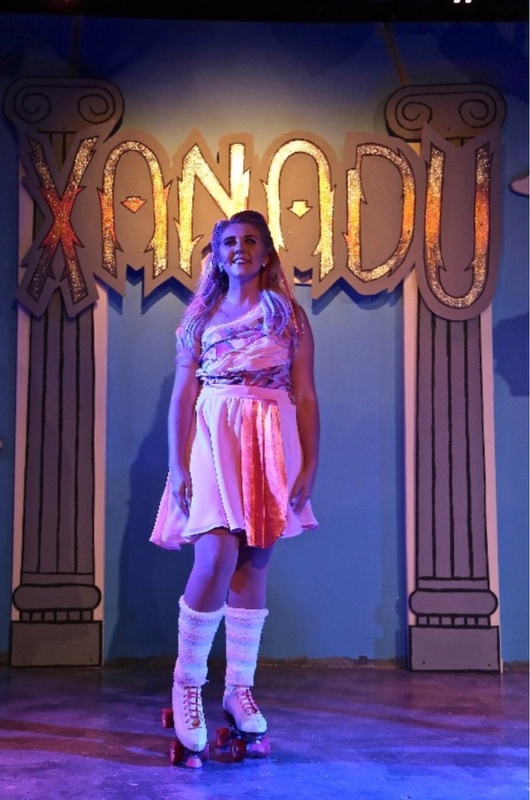 And now we’ve come full circle again with a very exciting and fun filled production of “Xanadu” at OnStage Playhouse in National City through Aug. 18th with artistic director Terri Brown’s staging this tongue in cheek delightful production. In the story, the main “Dude”, Sonny (handsome Joshua Tyler Powers) is a struggling artist suffering a little depression (what artist don’t?). He just can’t seem to get the images of Greek Muses (daughters of Zeus) he is painting on a sidewalk mural on Venice Beach the one in So. Cal. His conclusion; he’s a failure and better of dead. He writes a note to that effect and then attempts commit suicide. Just as he is about to jump off the sea wall, an intervention happens. 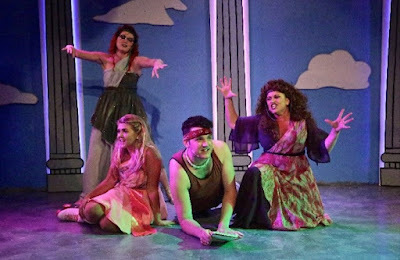 Unbeknownst to Sonny, Kira/Clio, (Olivia Berger) and her Muse sisters are watching his frustrations from Mount Olympus. She persuades her Muse sisters to travel to Venice Beach to inspire Sonny to continue with his painting. 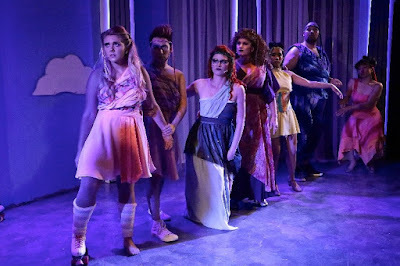 Magically, his unfinished mural comes alive with the Muses stunning Sonny and causing him to rethink his suicide note after a little intervention by Clio/Kira. She tells him that he is, in fact worthy of greatness. He confides to her that his real passion is opening a roller-disco. He wants to call it Xanadu! She nods that anything is possible. Flash back to some 40 years before, when another artist, Danny Maguire (Todd Sutton) was helped along by another Muse who happens to look very much like Clio. They go to his office to ask to use the very same space he originally built for another “Xanadu”. Only then Danny was interested in making money more than fulfilling his dream. Sonny wants to create his roller- disco in an abandoned building in Venice Beach. Coincidentally, Danny confesses he still owns the building. Now if it were all that easy, we wouldn’t have much to write about. The complications that set in are many. To begin with, Muses must always be disguised from mortals. All agree that Clio must now be called Kira. Decisions are made quickly for the transformation from Muse to Mortal: She will appear on roller skates; wear legwarmers, and carry weird Australian accent. (Remember Newton-John is from Australia and coincidentally Cleo’s given name is Olivia Berger). Evil is lurking in the wings when Melpomene/Medusa (an outrageously funny Debbie David) one of Clio’s sister Muses puts a curse on Kira/Clio and causes her to fall in love with Sonny (a no -no for Muses). The fun begins as soon as the lights fade and for the next 90 or so minutes, we are taken on a fun filled magical carpet ride that begins on a beach in Venice, Ca., travels to Mt. Olympus, skates around a story that’s loaded with plot holes (but who cares), weaves at least fourteen very recognizable Olivia Newton-John hits like “Magic”, “Evil Woman”, “Strange Magic” (both made popular by Lynne’s rock band ELO), “Suddenly”, “All Over The World” “Have You Ever Been Mellow?” and of course “Xanadu” into the script and drops us back to reality with smiles from ear to ear. The cast is more than up to the task. They are vivacious, energetic and talented and just plain having fun! Oliver Berger is spunky, but not overly demonstrative and still and manages those roller-skates quite well. As soon as she opens her mouth puts on that heavy Australian accent and blinks those beautiful peepers at us, we are off and running. The Muses are a trip. 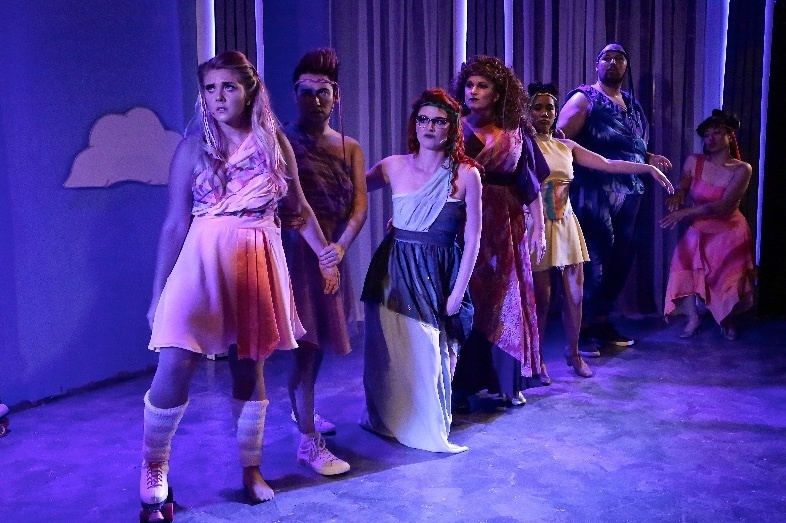 Two are played in drag Seejay Lewis is Thalia and Ryan Dietrich is Terpsichore and others. 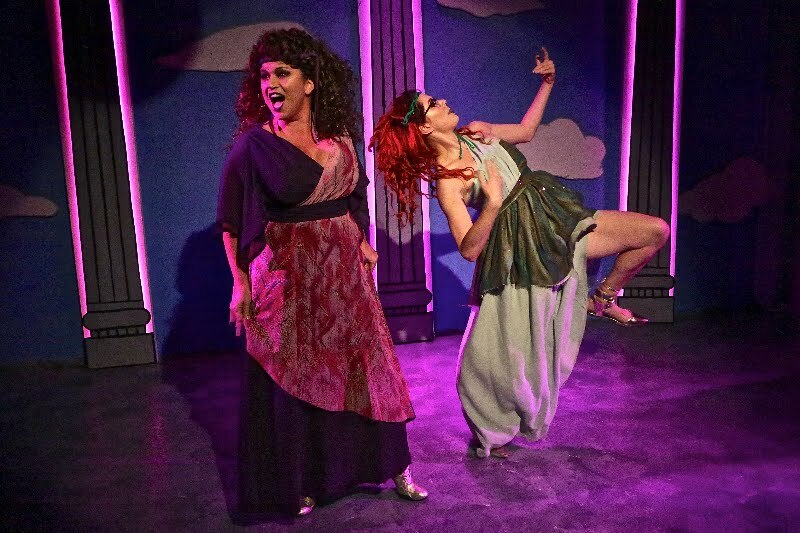 Debbie David is Melpomene/Medusa and Roxie Peters (is a blast) is Calliope and Aphrodite. The creative crew consists of choreographer Jonathan Mayuyu, with Roxie Peters assisting, musical direction by Martin Martiarena, Julan Sinks sound went somewhat amiss on opening night but by now all should be good to go, Ryan Dietrich and Pam Stomply-Ericson created and made the eye popping costumes (congrats). Chad Oakley is responsible for the sets lit in soft colors with Oakley's lighting behing the Greek Colums. A ride to Mt. Olympus on Pegasus (Dietrich), a phone booth that appears on Venice beach, a Centaur with Seejay holding up the rear (Too funny to define) and a Cyclops (Dietrich) and skating Muses are all there waiting for you to join them. It’s a fun packed evening of pure pleasure if you can transform yourself back to the ‘80’s, Olivia Newton-John, spandex, head bands sock warmers, really, really short cut off jean, roller disco, Greek Mythology and especially if you believe in “Magic”. Nice post! This is a very nice blog that I will definitively come back to more times this year!Much obliged to you for thinking about your substance.